Looking for or discovering an orbital mass may raise many questions. To provide at least partial answers, we will target the most frequent pathologies encountered and propose for each of them a practical presentation including specific clinical tips, imaging protocol and characteristic features. The lesion may be disclosed during a brain Computed Tomography (CT) or Magnetic Resonance Imaging (MRI), or alternatively looked for because it causes symptoms such as exophthalmos and visual or oculomotor alteration. Imaging plays a major part in etiological diagnosis and patient management. If MRI remains the principal imaging method, CT scan and ultrasound (US) with Colour Doppler flow imaging (CDFI) may be very helpful. These different imaging techniques may be associated, depending on the lesion. The orbital MRI protocol performed in our institution includes the following sequences: thin (3 mm) axial T1-weighted, coronal T2-weighted or T2-weighted Dixon, axial diffusion-weighted, then after contrast medium injection, axial and coronal Dixon or fat-saturated T1-weighted. Curves obtained during dynamic contrast enhanced T1-weighted sequence could give information about lesion permeability which partly depends on the presence (malignant lesions) or absence (benignant lesion) of abnormal vessels. According to the first results, modifications such as complementary plane or acquisition in prone position may be added. CT scan, useful to study orbital walls and calcifications, is preferred to MRI in case of emergency (serious infection, for example). Ultrasound with CDFI is the first imaging method in children with superficial lesions and is performed in adults to study a superficial or vascular mass and to appreciate orbital vascularization. In adults, the most frequent extraocular muscle (EOM) pathology is Grave’s disease, an autoimmune reaction mainly complicating a hyperthyroidism. The muscles are enlarged and spindle shaped. As inflammation is the first complication of Grave’s disease, MRI is mandatory to depict the high signal on T2-weighted fat-saturated or Dixon sequences, due to the edema it causes. EOM Metastases are the first diagnosis to suggest if the lesion is focal within the muscle. Intraconal orbital space lesions consist of optic nerve glioma, extremely rare in adults, is mostly found in children in association with type 1 neurofibromatosis (NF1), and meningioma. Mainly discovered in the checkup of an unilateral visual loss, this benignant lesion grows depending on the perioptical meningeal layer. It strongly enhances, and will progress toward the orbital apex, leading to an optic atrophy. Axial post-contrast T1-weighted fat-saturated or Dixon sequences are mandatory to depict apex and intracranial spreading. Lachrymal gland masses represent the main extraconal orbital space lesions. They are divided into epithelial lesions (pleomorphic adenoma, adenoid cystic carcinoma) and non-epithelial lesions (inflammation, lymphoma). A recent study demonstrated that resistance index (IR) measurement enables substantial distinction between epithelial (IR > 0.7) and non-epithelial (IR < 0.7) lesions. Among the intra- or extraconal lesions, cavernous hemangioma (the most frequent lesion encountered) shows a high signal on T2-weighted sequence, a progressive enhancement heterogeneous then homogeneous, (Figure 1). Orbital varix appearance may be challenging. Variation in the exophthalmos depending on the position of the patient is the diagnosis clue. Imaging protocol needs an acquisition, the patient being in prone position. Lesions of the orbital walls such as metastases, osteomeningiomas and fibrous dysplasia are the common diagnosis. Cavernous hemangioma. 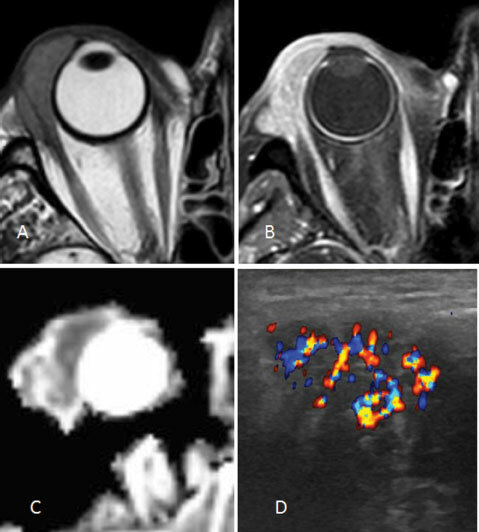 Axial T2-weighted (A) and fat-saturated T1-weighted imaging with injection: immediate (B) and delayed (C). Finally, ubiquitous lesions are mainly lymphomas and inflammations, well defined or causing large orbital infiltration, sometimes spreading through the superior orbital fissure toward the cavernous sinuses and the meninges. Malignant lymphomas, often of B type, tend to be located at the anterior part of the orbit, display a very low apparent diffusion coefficient (ADC) on diffusion-weighted MRI and a nodular structure of low echogenicity, separated by highly vascularized septa on CDFI (Figure 2). Lachrymal gland lymphoma T2-weighted (A), Post-contrast fat saturated T1-weighted (B), ADC (C), CDFI (D). In children, orbital immature angioma, often located on the lids, is very frequent and generally spontaneously disappears. Imaging is needed to rule out or manage orbital extension. Rhabdomysarcoma is the first diagnosis to propose for an orbital mass causing a rapidly worsening exophthalmos. It represents a therapeutic emergency. Optic nerve gliomas are often associated with NF1. Cystic lymphangioma, a rare polycystic lesion, has an evolution characterized by episodes of intracystic bleeding causing a sudden increase of their volume and worsening or apparition of exophthalmos, with risks of traction on the optic nerve. In conclusion, we underline the need for adapted protocol and multimodal imaging of orbital mass, especially in case of atypical tumor. Analyzing the images taking account of the location of the lesion is helpful for the etiological orientation. During the follow-up, identical MRI protocols should be performed.